So far this series has concentrated upon the optics of the compound binocular microscope, where the eyepiece is used to magnify the relatively small two-dimensional field of view produced by a single objective. This situation is commonly accepted by microscopists, yet is an artificial one, since we naturally use our eyes to derive three-dimensional information over a relatively wide field of view. Unlike most other animals, sight is our most perceptive sense. We humans gain most of the information about our surroundings from our eyes. Animals, such as cats and dogs respond predominantly to smell, while for others such as snakes, smell and temperature are both more important than sight. The hawk, as a predatory bird of prey needs powerful eyes, but it is less able to use this information for deductive reasoning. The human visual sense, therefore, is very much more than a direct stimulus, such as taste. In fact the eyes (via the optic nerve) ensure that part of our brains open directly out onto the outside world. Our eyes are offset by the bridge of the nose, so that we sense perspective and depth. Of all the animal kingdom we humans have developed our sense of vision into a critical faculty closely coupled with memory, reasoning and deduction. Early in infancy the brain learns to process the images conveyed by the eye. For a good review of visual perception and microscopy, see the Presidential Address to the Quekett Microscopical Club published in Bradbury (1994). Because this learned perceptive processing is so strongly ingrained, the lack of stereoscopic information, normally imposed by the two-dimensional image seen through the compound microscope, is probably the reason why so many people are content to practice photography alone. Far fewer people delve into the world of microscopy, beyond the visual acuity of the human eye, where stereoscopic information is usually lost. This restriction, however, has not prevented opticians from designing instruments to give stereoscopic microscopical images. There are, nevertheless, excellent reasons for eliminating stereoscopic effects at high magnification, an image lacking pseudo three-dimensional information is less likely to cause misapprehension, but primarily designers have concentrated on maximising resolving power at the expense of stereoscopy. Those wishing to read more of the theoretical basis of why this is so should read the Note on Stereoscopic Vision on pages 128–133 of Hartley (1993). Before we look in detail at the way in which stereomicroscopes have developed, some terminology should be explained. A binocular microscope is usually taken, by convention, to refer to the case mentioned in the first sentence, where the eyepieces are used to magnify the relatively small two-dimensional field of view produced by a single objective. This design transmits identical images to each eye at full resolving power, and makes for easier viewing, with greater visual acuity and less fatigue than a monocular microscope. One successful design of binocular microscope was introduced by Francis Wenham in 1860 (see Hammond, 1996), but the concept of the binocular microscope was not universally accepted until well after the Second World War. A different situation is encountered with the stereomicroscope. The early stereo instruments consisted of two objectives, which imparted separate images to each eye. In effect two separate monocular microscopes, one for each eye were used simultaneously. The final image seen using the stereomicroscope is processed and fused in the brain to give depth and perspective to give a three-dimensional image which is at once both erect and laterally correct. As Hartley (1993), in his excellent book points out, this simple distinction ignores the fact that a mono-objective binocular microscope can be easily adapted to give stereoscopic images. This will be dealt with later in the article. The first true stereomicroscope appeared at the end of the nineteenth century, when Carl Zeiss brought out the design developed by an American dentist, Horatio Greenough in 1897. This design can still be found in use today, for example see Figure 1. 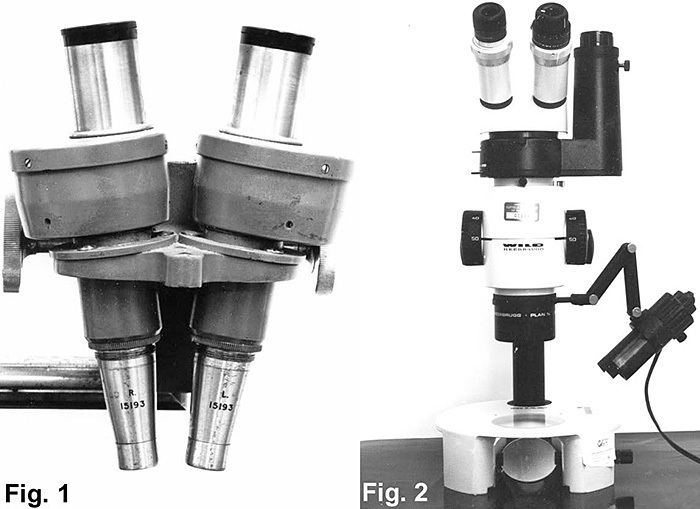 Two separate monocular microscopes are arranged in a convergent fashion (at a convergence of about 16°) and having paired objectives whose visual fields coincide. Porro prisms ensure that the images transmitted to the eyepieces are both erect and laterally correct. This is not usually the case with a mono-objective microscope system. The modern design of stereomicroscope now has one objective, instead of two, and is called the CMO or Common Main Objective design (Figure 2). In this case, the separate light paths pass either side of the diameter of the objective, and up the microscope body on either side, before being transmitted via independent prism systems along each separate converging eyepiece. The CMO design offers the dual advantages of longer working distances, and the use of supplementary magnifiers without the need to appreciably reduce the working distance. The magnification can also be changed by using a continuous zoom system. Notes on how to set up any stereomicroscope properly, so that the instrument will remain in focus throughout the entire magnification range, will be found in Evennett (1996). Figure 2. A modern Common Main Objective (CMO) stereo microscope. The advantage of the low power stereomicroscope with a large depth of field and a wide field of view, is that this instrument facilitates examination of specimens where it is necessary to show features in relation to surrounding structures simultaneously with those at different levels (which would otherwise be out of focus with a high-power binocular microscope). Dissection is exactly the sort of technique to benefit from using stereomicroscopes, hence dissection- and operating-microscopes have become synonyms for stereomicroscopes. Both the Greenough and CMO designs have their own inherent disadvantages when used to take photomicrographs. With the Greenough design, tilted image planes lead to out-of-focus edges of the field of view when photographs are taken down one tube unless the specimen is tilted so as to be perpendicular to the optic axis of the tube used to take the picture. The CMO design was introduced, again by Zeiss, in 1946 to obviate this problem, but another arises. The light paths pass through the edges of the CMO objective rather than the (better-corrected) Gaussian centre of the lens. For photography this may be overcome by sliding the objective laterally so that the centre of the objective lens is situated co-incident with one of the parallel light paths. For further details of photomacrography and stereo photography, see Freere (1996). Full details of practical photomicrography may be found in Bracegirdle (1995). For a stereoscopic effect in the final image, the illuminating ray bundles, or light paths, for each eyepiece must be separated. The illuminating ray paths can be separated using Polaroid semicircular polars in the condenser substage and polars of opposing orientation over each eyepiece. The method is described and illustrated in Martin (1968, 1993) and the theoretical basis explained in Hammond (1996). The original, 1968, article by Martin, and a comment on it by Hewlett, is readily available in electronic form on the DVD encompassing the Quekett Journal of Microscopy 1868–1992. A review of more complex methods, beyond the scope of this article, for achieving 3-D stereoscopic vision with high power binocular microscopes may be found in Greenberg & Boyd (1997). Bracegirdle, B. (1999) CD-ROM Review: 167 into 1 will go! Quekett Journal of Microscopy 38: 325–326. Bradbury, S. (1994) Microscopy in the round. Quekett Journal of Microscopy 37: 177–190. Evennett, P. J. (1996) Technical hints, Tips & Queries. Proceedings of the Royal Microscopical Society 31: 64–66. Freere, R. (1996) Stereomicroscopes, macroscopes and low-magnification imaging: a review of the advantages and limitations of these and similar devices. Proceedings of the Royal Microscopical Society 31: 9–15. Greenberg, G. L.; Boyd, A. (1997) Convenient and controllable direct-view 3D imaging in conventional light microscopes: approaches via illumination and inspection. Proceedings of the Royal Microscopical Society 32: 87–101. Hammond, C. (1996) Principles of stereoscopy in the single objective binocular microscope. Quekett Journal of Microscopy 37: 566–574. Hewlett, P. S. (1969) Aspects of colour and polarization systems for producing stereoscopic vision in the standard optical microscope. Quekett Journal of Microscopy 31: 207–209. Martin, L. V. (1968) Stereoscopic microscopy with the high power binocular. Quekett Journal of Microscopy 31: 42–51. Martin, L. V. (1993) A variation on the Polaroid system for stereoscopic microscopy. Proceedings of the Royal Microscopical Society 28: 123–124.